Hey, how ’bout that annular eclipse last week? Some great images flooded in to Universe Today, as the final solar eclipse for 2016 graced the African continent. This not only marked the start of the second and final eclipse season for 2016, but it also set us up for the final eclipse of the year next week. The path of next week’s penumbral eclipse through the Earth’s shadow. Adapted from NASA/GSFC/F. Espenak. We’re talking about the penumbral lunar eclipse coming up next week on September 16th, 2016. this sort of eclipse occurs when the Moon just misses the dark inner core (umbra) of the Earth’s shadow, and instead, drifts through its relatively bright outer cone, known as the penumbra. Though not the grandest show as eclipses go, astute observers should notice a subtle light tea-colored shading of the Full Moon, and perhaps the ragged dark edge of the umbra on the northwestern limb of the Moon as it brushes by around mid-eclipse. The visibility map for next week’s eclipse. Image credit: NASA/GSFC/Fred Espenak. The entirety of the eclipse will be visible from the region surrounding the Indian Ocean on the evening of Friday, September 6th. Viewers in Australia, New Zealand and Japan will see the eclipse transpire at moonset, and the eclipse will get underway at moonrise for observers in western Africa and Europe. The eclipse runs from first contact at 16:55 Universal Time (UT) to 20:54 UT when the Moon quits the Earth’s shadow almost four hours later. Mid-eclipse occurs at 18:55 UT, with the Moon 91% immersed in the Earth’s outer shadow. This particular eclipse is member 9 of the 71 lunar eclipses in saros series 147. This saros began on July 2nd 1890 and runs through to the final eclipse in the cycle on May 1st 2990. It will produce its very first partial eclipse next time around on September 28th 2034, and its first total lunar eclipse on June 6th, 2449. Why penumbrals? Aren’t they the ultimate non-event when it comes to eclipses? Like with much of observational astronomy, a penumbral lunar eclipse pushes our skills as a visual athlete to the limit. Check out the waxing gibbous Moon the night before the eclipse, then the Moon the night of the event. If you didn’t know any better, could you tell the difference from one night to the next? Often, the camera can see what the eye can’t. Photographing the Moon before, during and after a penumbral eclipse will often bring out the subtle shading on post-comparison. You’ll want to photograph the Moon when its high in the sky and free of atmospheric distortion low to the horizon, which tends to discolor the Moon. Such a high-flying Moon during mid-eclipse favors the Indian Subcontinent this time around. We’ve yet to see a good convincing time-lapse documenting a penumbral eclipse, though such a feat is certainly possible. When is an eclipse… not an eclipse? By some accounts, the Moon underwent a very shallow penumbral one cycle ago on August 18th, 2016, though the brush past the shadow was so slight that many lists, including the NASA’s GSFC eclipse page omitted it. Three eclipses (a lunar partial and a penumbral, or two penumbrals and one solar) can occur in one eclipse season, if the nodes of the Moon’s orbit where it intersects the ecliptic fall just right. This last occurred in 2013, and will happen again in 2020. And when there’s a lunar eclipse, there’s also a Full Moon. The September Full Moon is the Harvest Moon, providing a few extra hours of illumination to get the crops in. This year, the Harvest Moon falls just six days from the equinox on September 22nd, marking the start of astronomical Fall in the northern hemisphere and Spring in the southern. The relative ecliptic angle also ensures that moonrise only slides back by a slight amount each evening for observers in mid-northern latitudes around the Harvest Moon. Read Dave Dickinson’s eclipse-fueled sci-fi tales Exeligmos, Shadowfall, The Syzygy Gambit and Peak Season. The final eclipse for 2013 was a grand event, witnessed across the Atlantic and the heart of Africa this past Sunday. Like so many other photographers along the North American east coast, we were at the ready to greet the partially eclipsed Sun at dawn. And as the shadow of the Moon touched down, teams on land, air and sea were ready to meet with the fleeting umbra as it raced eastward towards sunset over the Horn of Africa region. But a fleet of spacecraft were also on hand to witness the rare spectacle as well. Turned earthward and sunward, these spacecraft documented not only the passage of the Moon’s shadow over the Earth, but recorded multiple partial solar eclipses from orbit as well. Electro-L had captured such a view before, during the annular eclipse over Australia earlier this year in May. Roscosmos increased the frame capture rate of Electro-L to twice its usual speed for the sequence. As you watch the Earth pass from a waning gibbous to crescent phase, you can just see the umbra, or central shadow of the Moon, slide into view and come into contact with the sunset terminator over eastern Africa. You can also see the cloud cover that marks the dust storms that plagued eclipse-chasers based around the Lake Turkana region in Kenya. One of the first public pictures of the umbra of the Moon as seen from space was taken from the Mir space station during a total solar eclipse in 1999. To our knowledge, such a feat has yet to be duplicated aboard the International Space Station. The phase angle of the ISS’s orbit during the eclipse was nearly perpendicular to the Sun-Moon-Earth syzygy, and unfavorable for this particular eclipse. Thanks to the Russian journalist Vitaliy Egorov for bringing the Electro-L eclipse sequence to the attention of Universe Today! Sunday’s eclipse and the Moon’s umbra off of the west coast of Africa as seen from the Aqua satellite. (Credit: NASA/GSFC/Jeff Schmaltz/MODIS Land Rapid Response Team). Launched in 2002, Aqua is part of the “A-train” (as in “Afternoon”) constellation of Earth-observing satellites. Perched in a low-Earth Sun-synchronous orbit, Aqua caught sight of the umbra of the Moon at around 14:45 UT on Sunday, November 3rd as it raced to make first landfall over the nation of Gabon and awaiting eclipse chasers. PROBA-2 used its SWAP imager to grab the sequences. Orbiting the Earth once every 99 minutes or 14.5 time a day, these “orbital eclipses” are quick, lasting about 10 minutes each in duration. The sequence runs from 7:30 to 18:30 UT on November 3rd. Note how the video shows the shadow fade in and sharpen as the eclipse touches down off of the US East Coast and intensifies from an annular to total along the first 15 seconds of its track, only to speed up and flatten towards sunset over Africa. And all in six seconds! We’d like to also mention a photo that isn’t a “solar eclipse seen from space…” Y’know the one, which shows the Earth, the Moon’s shadow, and a totally-eclipsed Sun, against a star dappled Milky Way. We won’t dignify it with a link. This has already been debunked by Bad Astronomer himself Phil Plait, but the bogus pic now seems to make its rounds across ye’ ole Web now during every eclipse. Seriously? Do we all crave “link juice” that bad? There are lots of real awesome eclipse photos out there, from Earth & beyond! Please, do your part to tell that well meaning friend/coworker/relative/stranger on Twitter that this “ultimate eclipse photo…” isn’t. Eclipse season is upon us this week with the first eclipse of 2013, a brief partial lunar eclipse. The lunar eclipse on April 25, 2013 is a shallow one, meaning only a paltry 1.47% of the lunar limb will be immersed in the dark umbra or inner shadow of the Earth. Observers can expect to see only a dark diffuse edge of the inner shadow nick the the Moon as is grazes the umbra. A partial lunar eclipse this shallow hasn’t occurred since May 3rd, 1958 (0.9%) and won’t be topped until September 28th, 2034 (1.4%). This is the second slightest partial lunar eclipse for this century. Another term for this sort of alignment is known as a syzygy, a great triple-letter word score in Scrabble! The eclipse will be visible in its entirety from eastern Europe & Africa across the Middle East eastward to southeast Asia and western Australia. The eclipse will be visible at moonrise from South America to Western Europe and occurring at moonset for eastern Australia and the Far East. The partially eclipsed Moon will be directly overhead just off the northeastern coast of Madagascar. The eclipse will not be visible from North America. Two eclipse seasons occur each year when the nodal points of the Moon’s orbit intersect the ecliptic while aligned with the position of the Sun and the Earth’s shadow. The Moon’s orbit is inclined 5.15° degrees with respect to the ecliptic, which traces out our own planet’s path around the Sun. If this intersection occurs near New or Full Moon, a solar or lunar eclipse occurs. The visibility region of Thursday’s partial lunar eclipse (Credit: NASA/GSFC/F. Espenak). If the Moon’s orbit was not inclined to our own, we’d get two eclipses per lunation, one solar and one lunar. 2013 has 5 eclipses, 3 lunar and 2 annular. The minimum number of eclipses that can occur in a calendar year is 4, and the maximum is 7, as will next occur in 2038. 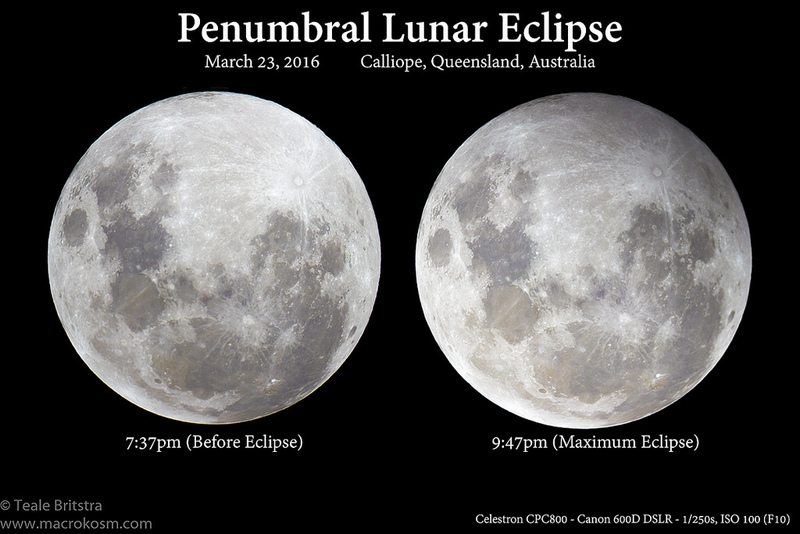 The 3 lunar eclipses in 2013 are this week’s partial eclipse on April 25th and two faint penumbral eclipses, one on May 25th and another on October 18th. There is no total lunar eclipse in 2013. The last one occurred on December 10th 2011, and the next one won’t occur until April 15th 2014, favoring the Pacific Rim region. This eclipse will also set us up for the first solar eclipse of 2013, an annular eclipse crossing NE Australia (in fact crossing the path of last year’s total eclipse near Cairns) and the south Pacific on May 10th. The only solar totality that will touch the surface of the Earth in 2013 is the hybrid eclipse on November 3rd spanning Africa and the South Atlantic with a maximum totality of 1 minute & 40 seconds. The length of the partial phase of the eclipse is exactly 27 minutes, and the length of the entire eclipse is 4 hours, 7 minutes and 42 seconds. This particular eclipse is part of saros series 112 and is member 65 of 72. This saros cycle began in 859 C.E. on May 20th and will end in 2139 on July 12th with a penumbral lunar eclipse. One famous member of this series was 52. This eclipse was one of many used by Captain James Cook to fix his longitude at sea on December 4th 1778. Christopher Columbus also attempted this feat while voyaging to the New World. It’s a fun project that anyone can try! I also remember watching the last eclipse in this series from South Korea on April 15th 1995, a slightly better partial of 11.14%. An occultation of the bright star Spica occurs just 20 hours prior as seen from South Africa across the southern Atlantic. This the 5th in a series of 13 occultations of the star by the Moon in 2013. The visibility region for the April 25th occultation of Spica. (Created by the Author using Occult 4.1.0.2). The +2.8th magnitude star Zubenelgenubi (Alpha Librae) is occulted by the waning gibbous Moon just 15 hours after the eclipse for Australia and the South Pacific. Another occultation of a bright star with potential this week is +4.7th magnitude Chi Virginis across North America on the morning of Wednesday, April 24th centered on 4:24 UT. Visibility region for the occultation of Chi Virginis on April 24th. (Created by the author using Occult 4.1.0.2 software). Full Moon occurs near mid-eclipse at 20:00 UT/16:00 EDT on April 25th. Colloquial names for the April Full Moon are the Pink, Fish, Sprouting Grass, Egg, Seed, & Waking Moon. Sure, the penumbral phases of an eclipse are subtle and may not be noticeable to the naked eye… but it is possible to see the difference photographically. Simply take a photo of the Moon before it enters the Earth’s penumbra, then take one during the penumbral phase and then another one after. Be sure to keep the ISO/f-stop and shutter speed exactly the same throughout. Also, this project only works if the eclipsed Moon is high in the sky throughout the exposures, as the thick air low to the horizon will discolor the Moon as well. Compare the shots; do you see a difference? A penumbral eclipse would offer a good proof of concept test for hunting for transiting exoplanets as well, although to our knowledge, no one has ever attempted this. Finally, calling out to all Universe Today readers in Madagascar. YOU may just be able to catch a transit of the International Space Station in front of the Moon just as the ragged edge of the umbra becomes apparent on the limb of the Moon. Check CALSky a day or so prior to the eclipse for a refined path… it would be an unforgettable pic! The position of the ISS on April 25th at 19:48UT, just minutes before the partial phase of the eclipse begins. (Credit: Orbitron). And if any ambitious observer is planning to live stream the eclipse, let us know and we’ll add your embed to this post. We do not expect an avalanche of web broadcasts, but hey, we’d definitely honor the effort! Slooh is usually a pretty dependable site for live eclipse broadcasts, and as of this writing seems to have broadcast scheduled in the cue.